On a bright, warm, sunny Saturday morning, just minutes after she arrived home, she just sort of sat down and collapsed and gasped a few times and she was gone, her hair shimmering like silver diamonds in the morning light on a soft bed of fresh spring-green growth. Dave was with her. “It’s ok, you’re home now,” he said. Then he told her it was ok for her to go. And so she did. We got Sandy almost exactly 14 years before she died. Steph was a college student working part time at the BFI landfill office near Denver International Airport. Some one had abandoned this woolly, frightened mutt there and she was running wild, looking for food and afraid of everyone and her own shadow. Stephanie spotted her and started working on becoming friends. She mentioned maybe bringing the pup-dog home and did not get an enthusiastic response from me. Not at all. But for some reason, Dave went to see Steph one day and he returned with this crazy-looking, fuzz-exploding full-grown dog. She was afraid of her shadow, this canine, afraid of us, afraid of the freak spring-snow we’d just gotten; she was afraid to move off the oval rug, her feet planted firmly as though she were hoping Scotty would indeed beam her up and away from our staring eyes. Her little spirit had been broken, somehow, by the completely stupid idiots who had dumped her at the landfill. Their loss was our total, joyful, utter gain! We always joked that we found a junk-yard dog and she never quit looking like she was fresh from the junkyard. She loathed baths and thought any sort of grooming was pure torture. She was a trembling, hairy mess, but we quickly saw the rich sweetness of her, the deep pools of love and loyalty behind those brown eyes. What shall we name her, we wondered? We toyed with Chewbacca (“Chewie,” for short), for she was similarly furry and gentle. But we couldn’t resist the name of the dog from the Annie movie the kids had grown up watching and since her hair was a millions shades of beige and brown, gold and copper, silver and cool grey, plus black and brown – “Sandy” seemed appropriate. True he ain’t pedigreed, Sandy, there ain’t no better breed. Sandy, Sandy who’ll always be there! 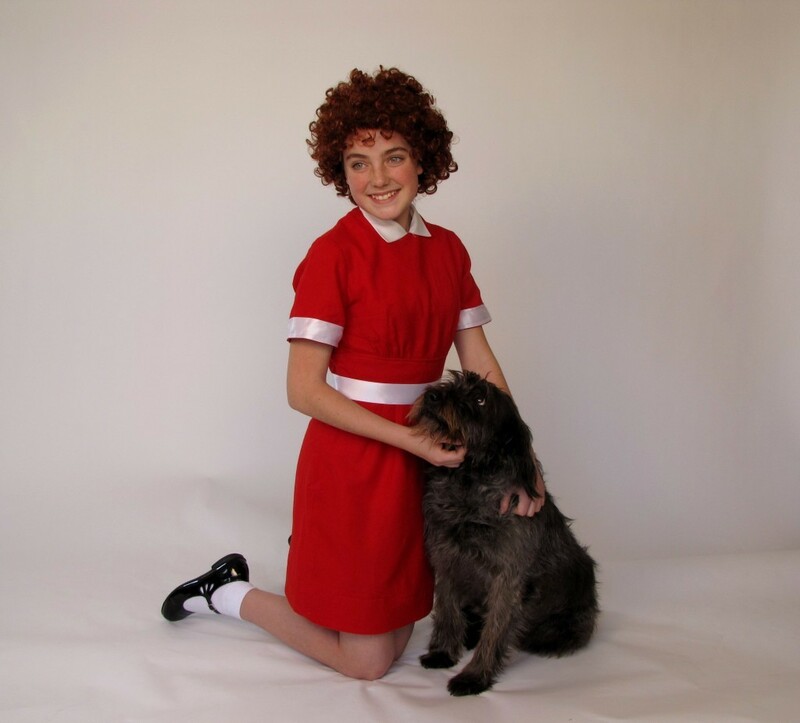 She actually got to play Sandy in a community theater production of Annie. This was a publicity shot in 2010. So we had this wild mutt. She became one of us immediately. She fit. She was born for us, for our family, I am completely certain. Sandy-the-dog was perfect for us. We didn’t know her age, but she was full-grown. An early vet visit declared she was “4,” but another one several years later also declared her “4.” So, we know she was probably 1-2 years old when we got her fourteen years ago. But she was an old soul, right out of the gate. She was able to navigate our huge family (5 kids, high school and college age) and our loud house full of friends and visitors. 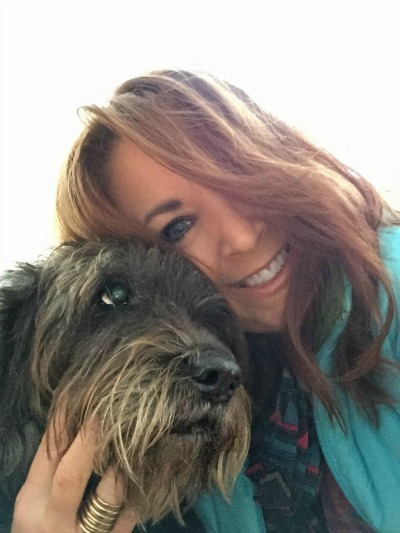 She was wise and deep in her devotion, love-filled and loyal, generous in adoration of her people and affectionate, loving those belly rubs and declaring anyone who would take the time to pet her to be her best friend for life! She just made sure you knew she was right there if you needed her. 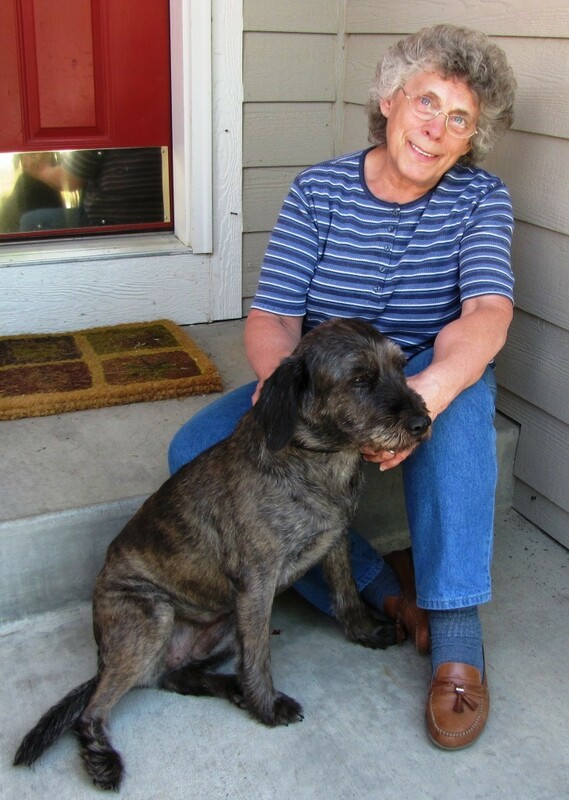 My mom and Sandy, summer 2009. They’re like sisters from different mothers, personality-wise. It was as if they’d always been close. She was Steph’s dog, then Steph got married and she became Rocky’s dog. Then he got married and she was Stormie’s dog. Then Stormie bought a house and she became my dog and I didn’t even really want that, but good grief, how had I lived without that? She was my buddy, my friend, my shadow. She worked with me in the garden, or she napped lazily there while I worked, but we loved spring and sunny days together. She sat as close to me as possible at all times and was my most trusted confidante during hard times and when I cried, she would move in close, place her paw and her face on my knees and look me straight in the face, as if to say, “There, there – everything will be ok. I’m right here.” She caught my tears when they fell. She lives for love and lives to love. The slightest kindness or gentle word from me and Sandy thumps a Morse-Code message of affection back to me with her ample tail. But she was a good dog. 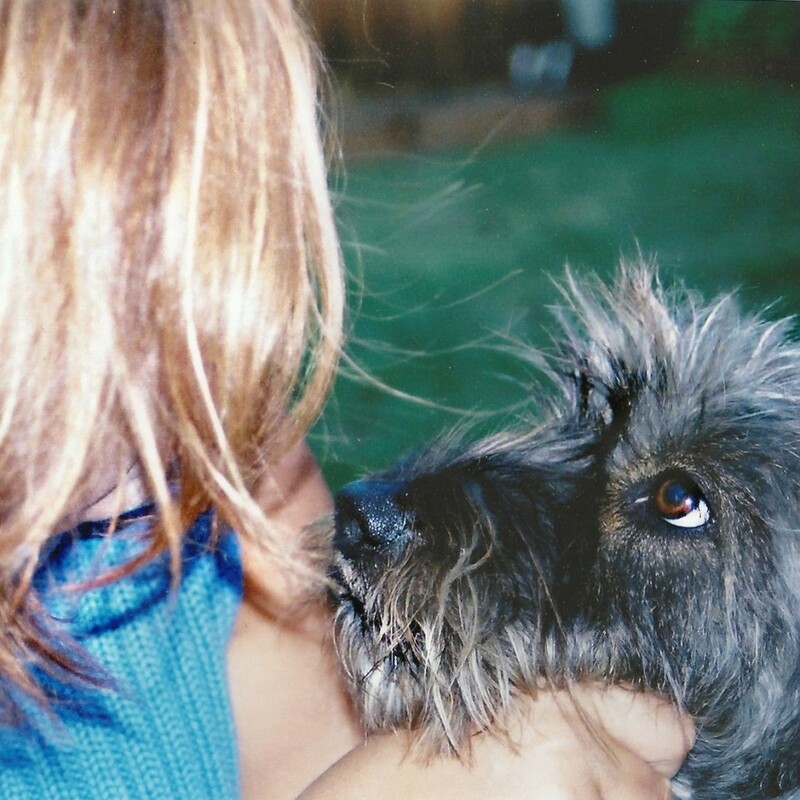 Because a good dog teaches us so much about love and loyalty and forgiveness. Sandy did that for me. She was affectionate and humble, sweet and protective, saving me from many a solicitor at the front door. Her bark could scare, but we always laughed that had a burglar just reached out to her, she’d have given them anything and everything they wanted. I loved her stretch, her behind in the air, back-back-back, then forward lunge, with her face to the sky, all the while making a loud old-man stretching sigh. Or how she’d grab a dryer sheet and waller all over it, so she’d smell nice for us, I assume. My old Sandy-girl, she was faithful and loving and loyal to all of us, the whole tribe of us, including each new grandchild as they came. Once she learned on the first grandchild, how to love and protect, she always understood, new baby by baby. They trusted her, too. She was our dog and we were her people. Sandy with my grandson Kai. He was 1 3/4. 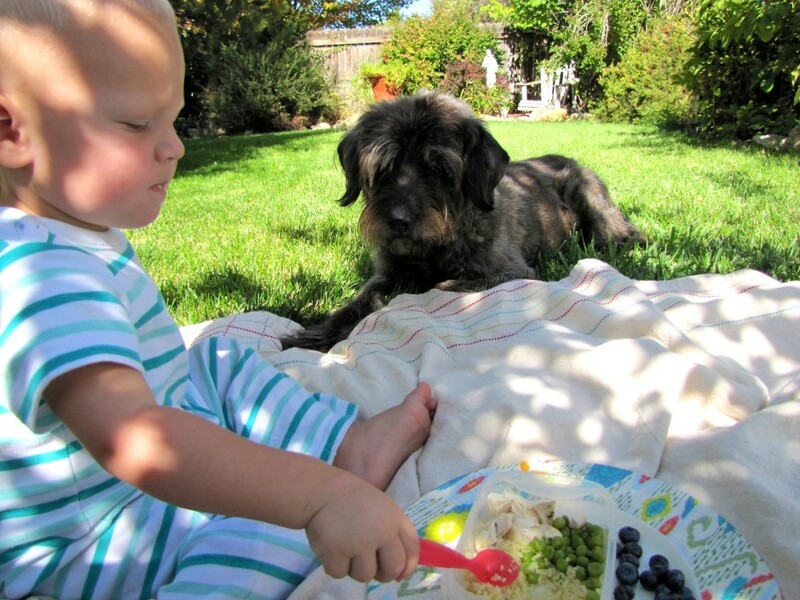 About 6 months before Sandy died.She patently waits, hoping he’ll send chicken her way. Sandy never met a human being she didn’t want to love zealously with her whole heart and to forgive if they didn’t like dogs or just couldn’t return her affection. Oh, she was a lover. 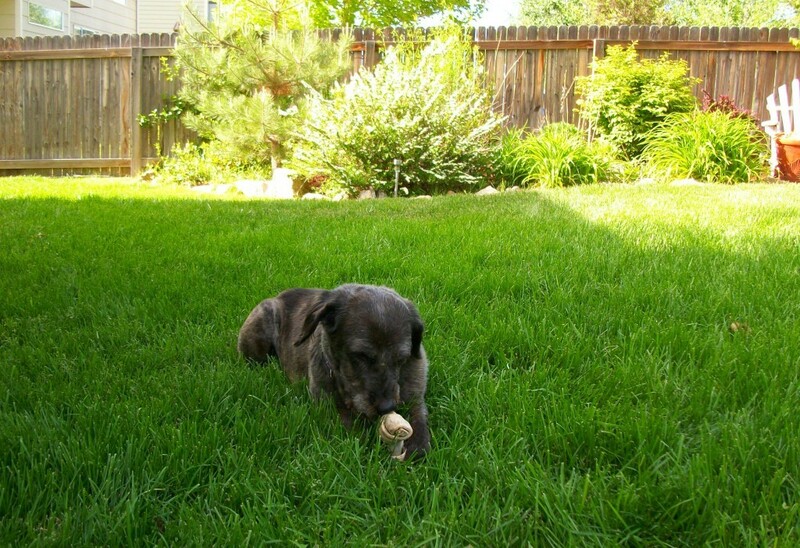 We were planning to put her down soon, as ailments of old-age were taking a toll, but on that Saturday morning, when my husband took her into the backyard on the brightest and loveliest of spring days, she just dropped and gasped a few times and he gently gave her the ok to go. And even though I ran out, dropped to the ground and called to her, Sandy-girl, hey girl, are you ok?, Hey Sandy, come here, girl...trying to woo her back, gently jostling and petting my old dog to awaken her, she kept on going. The birds were singing in the blue, blue sky, and the old trees were filled with youthful, green buds for a new season, a new life; and the day was alive, humming its spring melody, so perfectly beautiful – just like every day Sandy gave us for 14 years. What a lovely, sweet tribute to a lovely, sweet soul. Our furry family members, they steal our hearts and leave an empty space when they head to Heaven before we do. I know you will see her again, your sweet Sandy-girl. And what a reunion that will be! Umm, you’re killing me over here, Smalls! She was such a good dog. Completely made for our family. I miss her. I love you too, Sandy. Such a good, good dog. What a wonderful tribute. Brought tears to my eyes. She was a lovely dog. I remember the week she was “mine”. I also remember how much she missed you. She wouldn’t eat for two days. And then I remember how over joyed she was when you came through my door to pick her up. What love. Yes, she will always be remembered. Love the picture of the two of you together.